NOTE: This page attempts to reflect stances of candidates but is limited to what I could find in my limited time. If you are a candidate and you want your stance known here or you see an error with something I have written please contact me at 775-247-1586. On Monday, June 9, there will be an event in Reno where sheriff candidates will publicly discuss guns. June 9, 2014 - I met all of the Sheriff candidates except for Tim at Maccabee Arms today. I have summarized my notes from the interactions. June 6, 2014 - Jim Lopey (or someone claiming to be him), appears on Nevada Shooters forum, proclaims himself a proponent of Campus Carry. June 3, 2014 5:00 PM - I got a response from Sheriff candidate Jim Lopey to my e-mail. June 3, 2014 Early AM- I have received responses from questions from Jeanne Herman (running for Washoe County Commission) as well as Tom Tighe (running for governor). May 23, 2014 10:20 - I just got off the phone with Rick Fineberg. He is a member of the Gun Owners of America, the NRA, a supporter of Campus Carry and Constitutional Carry. He also founded GOD, which if I recall correctly stands for "Gun Ownership and Defense," and focused on Senior Citizen self-defense. May 23, 2014 - First of all, I apologize I couldn't get this page up sooner and for the sparsity of information. I expected to have more time but I became unexpectedly busy. So far I've only talked to a few candidates, Chuck Allen running for Sheriff and Rick Fineberg running for Assembly District 25. News channel 2 interviewed the Sheriff's candidates on gun rights. Chuck Allen is also endorsed by Thom Collins, father of Amanda Collins, who are advocates for allowing concealed carry on college campuses. Under Nevada law, NRS 202.3673, if a building is posted with a sign at each entrance stating that firearms are not allowed in the building, then a concealed firearm permit holder may not carry a firearm within the building. However, NRS 202.3673 only specifies that concealed carry is banned by this, and NRS 244.364 states that except as provided by specific statute, the state legislature reserves for itself the rights and powers necessary to regulate most aspects of firearms. Between the two of these laws, there does not appear to me to be any basis for the Sheriff's office to ban the open carry of firearms in the lobby area of the building nor in the records area where a person would go to submit a concealed firearm permit. However, despite the law, the Sheriff's office has a policy of forbidding firearms entirely in the building and doesn't seem to care that this is contrary to the law. Further, the law does not compel the Sheriff to ban concealed carry within the lobby, either. Personally, I feel that the Sheriff's office should respect state law and allow open carry within it, and furthermore I do not understand why the Sheriff's office has opted to ban concealed carry of firearms within the lobby. This serves no positive purpose, and only serves to disarm the good people who visit the Sheriff's office, leaving them vulnerable to attack on the way to and from the office and also causing many guns to be left unattended in parked vehicles where they are more easily stolen. As Sheriff, will you continue to enforce an invalid ban on open carry in the lobby and records part of the building? And further, as Sheriff, will you take down the signs that ban concealed carry within the lobby? Further, will you recognize in general that NRS 244.364 invalidates county, city, and town firearm rules, other than those regulating the discharge of firearms? Personally, I think if we had a friendly face in the Sheriff's office who respected state gun laws and supported the right to bear arms, it would be a nice step forward. I talked to Chuck Allen about guns in the Sheriffs Office, particularly in the records section. I suggested that the signs should be taken down to allow concealed carry, and that open carry should be allowed in any case. Chuck said that his concern with openly carried firearms was that an inmate could try to take a gun away from someone, and that even in the records area some inmates may be allowed to do things like janitorial work. I brought up that deputies already carry in that section of the building, and that probably any inmate allowed in that section would probably be one of the more trusted ones anyway. He told me he needed to look deeper into the law and that he will get back to me about this issue. Unfortunately, I lost reception during part of the call and didn't catch some of what he said when it sounded like he was saying something very interesting. I think he was saying something about it not being much different than a movie theater or other place where people can do that. Chuck did make statements in favor of gun rights. He sounded a bit concerned about a person open carrying in the Sheriff's office. At first it sounded like he was going to support open carry in the sheriff's office when I showed him the laws. But ultimately he said he'd really have to think about it on the issue of open carry at the Sheriff's office. I talked to him about having a place to check them in for going back into the jail section and allowing firearms in the records section and he sounded receptive to it. He told me that he also hasn't been completely sold about constitutional carry yet. I asked him if he would issue a permit for a person to carry a concealed weapon other than a firearm, like a dagger. He said on a case by case basis he may issue one. He agreed that many of the Washoe County Codes looked invalid. He also told me that he does not believe in Universal Background Checks but would encourage people to do transactions at a gun shop if the people do not know each other. He seemed to be in favor of campus carry, although he did state some reservations about a student who might use alcohol. 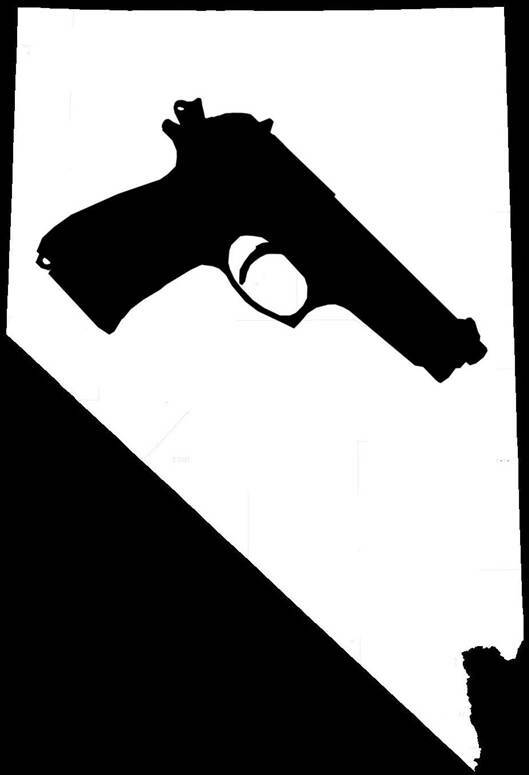 Under Nevada law, NRS 202.3673, if a building is posted with a sign at each entrance stating that firearms are not allowed in the building, then a concealed firearm permit holder may not carry a concealed firearm within the building. However, NRS 202.3673 only specifies that concealed carry is banned by this, and NRS 244.364 states that except as provided by specific statute, the state legislature reserves for itself the rights and powers necessary to regulate most aspects of firearms. Between the two of these laws, there does not appear to me to be any basis for the Sheriff's office to ban the open carry of firearms in the lobby area of the building nor in the records area where a person would go to submit a concealed firearm permit. However, despite the law, the Sheriff's office has a policy of forbidding firearms entirely in the building. I can understand trying to keep firearms away from the inmates, but can't this be accomplished by metal detectors near the jail section of the Sheriff's office? Ideally, there would be a place for people to check in their firearms so they could visit the jail section, and the rest of the office should allow carry. He told me that a person shouldn't carry a gun near a prison, and the records section of the Sheriffs office is right next to the jail. He said he would not support carry of a firearm in the building. I suggested a place to check in weapons and he agreed with that. When it came to invalid county codes, he told me that I needed to contact the legislature if I am concerned about Washoe County Code.. I asked him whether he would issue a concealed dagger permit. He sees no problem with issuing a dagger permit to a person who has a concealed firearm permit. If I can get your stance on this matter, I would like to publish it to my blog. He told me he shot guns since he was old enough to shoot, and talked about how people used to bring their hunting guns to schools way back in the day and it wasn't a big deal. Based on the laws I showed him, he agreed with my positions on open carry in the Sheriff's office, and thus would allow open carry within the office. He also agreed that many of the Washoe County Codes are not valid. Lopey is definitely pro freedom. I've witnessed command staff mock him for his unwavering support for the second amendment when it mattered. Loopy has my vote. I've known him for over a decade and he is staunchly on our side. Plus, I grilled him on topics like CLOE sign offs on NFA transfers and the topic of congested area postings. He passed, with flying colors. The grilling happened when he brought his son out to shoot with us at the MOA range day back at the end of March. Don't judge candidates on sound bites, talk to them. 1. From day one my 10 point plan (jimlopey.com) includes my strong support for the second Amendment. 2. I have been an avid shooter since I was old enough to shoot. I shoot regularly. 3. I have been a Life Member of the NRA for close to 30 years. What other Sheriff candidates are members of the NRA? If so, for how long? 4. I believe in the constitution and will protect our citizens if anyone attempts to violate same. 5. I am an avid hunter and a member of SCI. I have hunted in Africa on four separate occasions and hunt every year in Nevada. 6. I support the Right to Carry and I support quicker CCW backgrounds. 1. I attended UNR and UNLV. I always carried. I realize most of the time I had peace officer status but I always carried. 2. I have taught active shooter classes all over the state. Universities are vulnerable. Cho killed 32 at VTech. 3. Show me statistics that would justify why lawful citizens should not be allowed to carry on campus and I might change my view. I was being sarcastic--there are no statistics that would justify not being able to carry. This is a political issue that has been exacerbated by mostly liberal thinking academians. It is what it is. I would support CCW carry on University campuses through the Chiefs and Sheriffs. However the opposition is strong but I would support the right to carry on college campuses period! I always carried on campus because I have sought education all my life but have had a duty to protect should a crime occur. I also walked into an armed robbery many years ago. I also teach in college but refuse to be in a situation where I could not protect myself or my students should there be an active shooter. I sent a similar e-mail to James Beltron, but I got no response. Here are some notes from my discussion with him at Maccabee Arms on June 9th. He doesn't recommend carry in the Sheriff's Office because already have armed deputies, and a lot of people don't practice weapon retention. He thinks he can ban carry in the Sheriffs office as if it were private property. He would prohibit people from carrying in the building. When I raised that then people would have to leave their gun in the car, where it can be stolen, he said that a person should not bring their gun at all. I said that would mean they would have to be disarmed their whole trip, and he didn't seem to care. When I told him about invalid Washoe County Codes, he told me he would approach Washoe County Commission about the Washoe County Codes that may be invalid, and ask the district attorney opinion on them. He said he would not approve a dagger permit if someone applied for one, as he feels that there has to be some limits. Tim Kuzanek did not respond to my e-mail. He did not show up at Maccabee Arms either, at least not during the period of time I was there to interview Sheriff candidates. I also noticed on the NRA-PVF website http://www.nrapvf.org/ that Ed Hamilton and William Tarbel did not get perfect scores from the NRA. I also asked them if they knew why. He wasn't sure exactly why the NRA gave him a lower score but it could have been because he gave some qualifications about one of the questions on an NRA questionnaire. He says that he agrees with allowing for campus carry if the person has the permit and is qualified under law to carry and that it should be treated like other places. He also said that he supports constitutional carry as it is practiced in several other states, allowing a person to carry concealed firearms without a permit. He believes people should be trained, but not have to go through the paperwork, and that they should be held accountable for their mistakes. He told about how he learned to use guns from a young age as a child and had safety principles instilled in him by his father. He believes that localities should stay within state law and obey state preemption law if it exists. He also said that he doesn't agree with gun registration and thinks that the paperwork required when buying a gun is unnecessary, and talked about how the 'behavior police' in modern society gets ridiculous. He said that he doesn't see how tracking all of this information about guns helps. We discussed mental health briefly, and he told me about the Santa Barbara shooting, and how the police had been in contact with the perpetrator beforehand but could not find anything wrong with him. I think his point was that it is very hard to actually determine who is crazy. He also pointed out that the perpetrator started by using a knife and a hammer. He said that if you could prove they were dangerous than he agreed at that point with stopping them from getting guns. I then suggested to WIlliam Tarbell that if someone was well enough to be free in society and use dangerous things like automobiles that they should be allowed firearms as well. He responded noting that today many people are allowed to be free in society with mental illnesses that might have prevented them from being on the loose in the past. I brought up that I felt that the use of mental health records to determine who can be a gun owner could backfire by causing people not to seek help in fear of losing their rights. He seemed to agree with the spirit of what I was saying. William Tarbell also said that when Brian Sandoval was governor, and SB221, (the bill banning private sales,) was up for discussion, if he had been governor instead of Sandoval, he would have approached the legislature and told them not to waste their time with the bill because he was just going to veto it, rather than doing what Sandoval did with the phone survey asking for public opinion on the matter before placing a veto. He also told me that he thought a lot of people, such as relatives giving each other firearms, wouldn't comply with it even if it was law. I have a Concealed Carry Permit issued by Las Vegas Metro. I agree with training before carrying concealed (the class was an eye opener to the laws). Right now, the only way to guarantee training is by requiring a permit. Open carry should stay the way it is (I feel there is a difference). I fully support Campus carry and carry in all State buildings. There should only be State requirements in NV and every locality should be required to follow State guidelines. I also believe every sale should require an FBI background check (with no database following the check). I also support getting rid of the requirement to register handguns in Clark County. GUN CONTROL: I have a Concealed Carry Permit issued by Las Vegas Metro Police Dept. I support background checks for ALL sales. I do not support firearm registration and will actively seek elimination of the Clark County program. Notably, in a mailer supporting Pat Hickey, it suggested that Rick Fineberg was too far to the right and pointed out that Fineberg founded GOD, an organization called Gun Ownership and Defense. Supporter of Campus Carry, and Constitutional Carry (allowing CCW without a permit). Under NRS 244.364, the state legislature reserves for itself such rights and powers as are necessary to regulate firearms. http://www.leg.state.nv.us/NRS/NRS-244.html#NRS244Sec364 In the Washoe County Code, there are number of provisions that violate state law. On my website I have highlighted them in red: http://armsinfo.com/nevada/local.htm#washoe If elected, would you help repeal these illegal ordinances as well as other pointless weapon ordinances that are not firearm related? Also, would you support taking down the "no guns" signs on county buildings to allow concealed carry? The signs presently require a person to open carry within county buildings as NRS 202.3673 only applies to concealed firearms. Disarming law-abiding citizens will only create a free-fire zone for criminals. Further, would you push to reduce limits on weapons in Washoe County as a whole, and oppose measures to ban exploding targets? County gun ordinances are one of the reasons I am running for commissioner. Over the past year we have been attempting in Warm Springs to regain our shooting rights which have been suspended by an order from the sheriff"s office and passed by the county commission. It is a really big issue out here as we all live on 40 acres or more and it should not affect us. So we have been having meetings with our commissioner which has done little. But the county counsel and the county manager are in agreement with us but it is still a work in progress. We need a second amendment commissioner and sheriff and we can make the necessary changes on the county level, and I would be very happy to work with our legislators as I have done in the past to make the necessary changes to the state level. It should not be so confusing and contradictive. I will look forward to talking with you and making a plan to correct these errors in the law. Thank you so much for your interest in this issue. You can count on me. Here are some of notes from a phone call I had with him on June 2, 2014 at about 2:30 PM. I asked Dennis about repealing country firearm codes that violated preemption, and he said he would review why they are in the County Code to see if there was a good reason they were passed, but that he may favor repealing some of these codes IF THEY ARE ILLEGAL. I asked Dennis about removing the signs banning concealed carry in Washoe County Buildings and he said he'd have to look at the reasons for the bans and thinks that there could be some good reasons to ban carry in some of the buildings, but in some cases he doesn't see a reason for the ban he might be open for discussion on the topic. I asked Dennis about shooting at night time, noting my concerns that the Washoe County Code restricts night time shooting which prevents me from facilitating firearms training at night. He agreed that people should be allowed to shoot at night FOR PRACTICE, especially at shooting ranges. I asked Dennis about the carrying of weapons other than firearms, and he said while he believes collectors should be allowed to own weapons like stillettos that are designed primarily to hurt others, BUT that he doesn't feel that people should be allowed to carry SOME WEAPONS IN CERTAIN SITUATIONS. I asked Dennis about WCC 50.034 that allows the Sheriff to ban carry of guns during civil emergency. He talked about extreme circumstances where it may be necessary for government to prohibit people from carrying guns in certain areas. For instance, he was saying if there was an active turf war between the rival gangs in a specific area. Dennis told me that he thinks there are some areas in Washoe County that are off limits to shooting that SHOULD BE ENFORCED, SUCH AS GRAVEL PITS NEAR HOMES, BUT THERE MAY BE OTHER AREAS he thinks should be open for shooting. I asked Dennis if he had any thoughts about exploding targets. Dennis told me that when it comes to exploding targets, he would like to hear expert testimony about whether they pose a fire hazard before making any decisions regarding them.